Café Du Monde, 800 Decatur St, New Orleans, LA. Café Du Monde is a glorious, well-known institution in the French Quarter, bringing joy since 1862. It is a ‘must’ when visiting New Orleans. Open 24 hours a day, anytime is a great time for a cup of café au lait and an order of beignets. The café au lait is made with half coffee (a French heritage coffee and chicory blend) and half dreamy creamy hot milk. One order of beignets gives you 3 warm angelic pillows of fried heaven, covered in powdered sugar. Tende,r flaky, golden goodness pairs perfectly with café au lait. Sitting indoors or out in the large covered patio, there is no better way to start your morning. If you’re lucky, there is live music to enjoy. Either way, you get tasty treats, great atmosphere, and happy people. Enjoy! Tips: Beware not to inhale while taking a bite of your beignet. You’ll get powdered sugar filled lungs and a coughing fit on top of it….yeah, it happened to me. It’s also advisable not to wear black, as the sugar has a mind of its own…under the ceiling fans. Yes, that happened also. Live and learn, now I’m a pro! 5 out of 5 perfect powdered sugar smack-a-roos! As seen on “Man v Food” and “Food Paradise” on The Travel Channel. Skippers Smokehouse, 910 Skipper Rd, Tampa, FL 33613. Adam Richman’s Best Sandwich in America show, on the Travel Channel, intrigued me to try the star sandwich, the Blackened Grouper Reuben. So, I made my way to Tampa and found Skipper’s Smokehouse. It is quite a place. It looks like a big swamp shanty. Very VERY casual, relaxed wait staff, and southern-back-woods-Redneck-ishVille atmosphere. 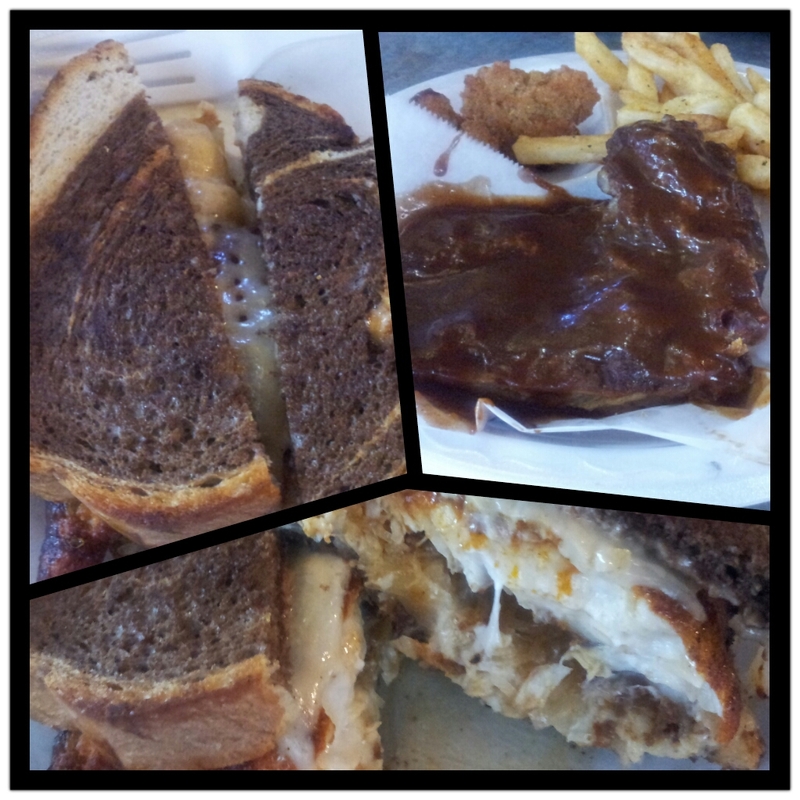 Order up for the sandwich of choice, and the Smoked Gator Ribs shown on the Travel Channel’s Man V. Food. The sandwich came on marble rye, a beautiful piece of grouper perfectly seasoned with Cajun spice and blackened to the right degree. The swiss, sauce, and sauerkraut were the right combination to balance it to amazing-ness. Adam Richman moaned after his first bite, I moaned after my first bite. OMG…frightfully delish. Definitely on my top sandwich roster! If you don’t mind lackadaisical service and shanty ambiance ( I thought was charming), the Blackened Grouper Reuben is worth the visit. Skip the Gator ribs and try the Cajun popcorn (crawfish tails), Smoked Fish Dip, or Key Lime Pie instead. http://skipperssmokehouse.com Restaurant, bar, music venue. 4.75 out of 5 points for Adam Richman’s sandwich pick. 3 out of 5 for everything else.